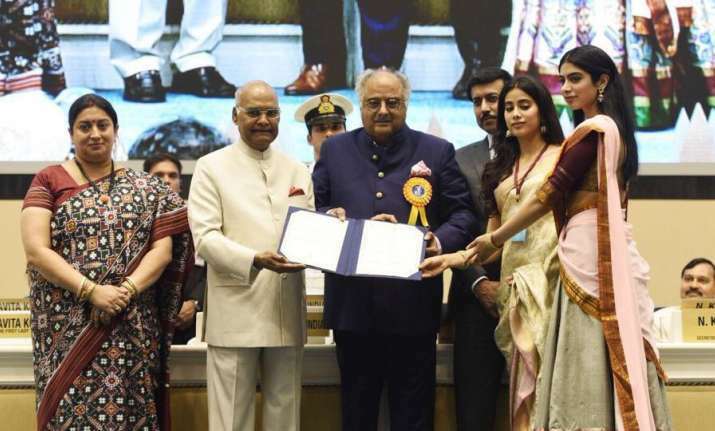 Boney Kapoor, Janhvi Kapoor and Khushi Kapoor collected Sridevi’s National Award for Best Actress for her performance in Mom at a ceremony held in Vigyan Bhawan, Delhi. This made Sridevi’s co-star Anil Kapoor took to Twitter to describe the moment as heart-warming and proud. He also described Sridevi as an incredible person. Sharing a photo of Janhvi, Khushi and Boney collecting the award on Sridevi’s behalf, the actor wrote, ”Such a proud & heartwarming moment for all of us to watch these beautiful people accept an honor for the most incredible person there ever was!” The photo also featured President Ram Nath Kovind, Information and Broadcasting (I&B) Minister Smriti Irani and Minister of State I&B, Rajyavardhan Singh Rathore. Anil Kapoor and Sridevi have given many movies including Laadla, Jaanbaaz, Judaai and Roop Ki Rani Choron Ka Raja, however, their most splendid performance continues to be in Shekhar Kapur’s Mr. India. On a related note, Sridevi’s elder daughter Janhvi who is all set to make her debut with Dharma Productions’ Dhadak wore her mother’s old saree for the award ceremony. The ivory and pink sari with gold border looked beautiful on her. She rounded off her look with jhumkas and bindi. Khushi Kapoor also chose an ethnic attire for the occasion. In Pics: Shah Rukh Khan and AbRam’s mini escapade to the Alps.